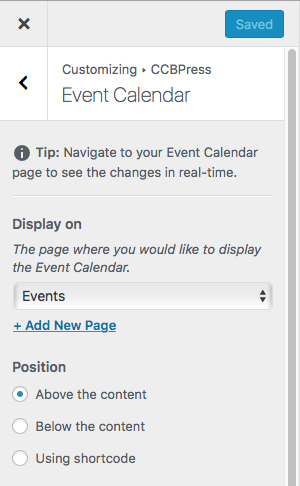 These are the settings for displaying the Event Calendar on your website. You can get to these settings by going to Appearance > Customize from your WordPress Dashboard and clicking on the CCBPress panel or by going to CCBPress > Getting Started and clicking on the “Go to the Customizer” button. This is the page where you would like to display the CCBPress Calendar. You must first create the page from the Pages menu of the WordPress Dashboard. After the page is created ,you may select it from the list. The default campus to show events from when the calendar is displayed. Checking this box will hide the campus dropdown on your calendar. By checking this box, the calendar will display a small note below itself with the words, “Powered by CCBPress”.